Almost a month to go ahead of the traditional rainy season in Gbudue State, 430 kilometres west of South Sudan’s capital, Juba, smallholder farmers are already tilling their land as they prepare to plant purer, drought-tolerant seeds. It was almost four years ago in 2015 that members of Farmer’s Frame of Idiofa (FFI), a farmers group in the Democratic Republic of Congo (DRC), produced a mere eight tonnes of sweet potatoes on two hectares of land. But the main reason for the low yield had not necessarily been a climate-related one, but an educational one. 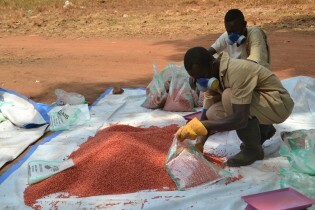 A genetic resource centre run by the Nigeria-based International Institute for Tropical Agriculture (IITA) has banked thousands of crop varieties for disaster relief and research, holds the world’s largest and most diverse collection of cowpeas, and contains some of Africa’s rarest insect species.